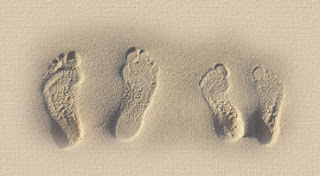 Melissa at Raindrops has a beautiful poem posted on her website entitled, These are my footprints. She said that I could share with my readers. "These are my footprints, so perfect and so small. These tiny footprints, never touched the ground at all. Not one tiny footprint, for now I have my wings. These tiny footprints were meant for other things. That's lovely Lea, thank you and thank you Melissa for sharing it. Beautiful Lea, thank you so much for sharing. I love this poem! Do we know who wrote it? I think it would be perfect for our walk to remember! I can just see our children running around trying to get our attention. I think sometimes we do need to stop for a moment, and just listen. That is so beautiful. Thank you so much for sharing it with all of us. I love it !! Thanx for sharing !! Just wonderful. Thanks for sharing. I cry every time I read this. I had it read at my daughters funeral. I would love to read this for Lukas. We are coming up on his angelversary. Thank you for sharing this. I saw your picture and letter on the right hand side of your precious Nicholas. He was born the day after my precious Chaya was. Also sleeping. The poem in this entry is beautiful. I've been having some darkness issues the last few days, and while the poem made me cry, it also gave me some peace. Thank you for sharing it. Beautiful poem. And I loved your birth announcement in your last post.